I never had the pleasure of attending a wrestling match at the old Richmond Arena. I knew of the Richmond Coliseum, but not being from the area, I had never even heard of the Arena until I met David Chappell in 1998 and heard tales of great adventures he had attending wrestling shows there while growing up as a teenager in Richmond. Over the years as I researched old wrestling venues in the Mid-Atlantic wrestling territory, I began to learn more about this grand old building and its rich history in the city of Richmond. Mike Harris of the Richmond Times-Dispatch wrote extensively on the history of the Arena for his newspaper in 1997 in advance of the building being town down. The building was considered an architectural gem of the early 20th century, he reported. It served many purposes over its 90 year lifespan before being torn down in 1997. This building that would later become the Richmond Arena was actually built in 1906, opening in 1908 as an exhibition hall and serving as an administrative building for the State Fair of Virginia. The During World War II, the building was used as a U.S. Army motor pool. After the war, the Virginia State Fair moved to a new location and the building was turned over to the city of Richmond where it was used as a garage for city vehicles. Harris reported that in the early 1950s, Richmond University began looking for a larger venue for their basketball team to play as the on-campus gym could not support the crowds that wanted to see them play. No venue in the area held more than 2000 people. It was then that Clyde Radcliff, whose father had run the State Fair many years earlier, had the idea to convert the old run down city garage into a sports arena. The first sporting event held there was a basketball game on December 17, 1954 between the University of Richmond and Virginia Military. 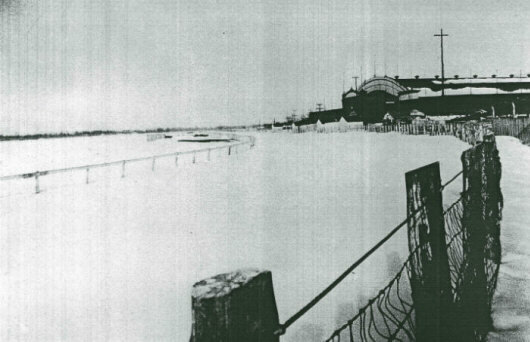 When it opened as a multi-use sports and entertainment venue in 1954, The Arena had 4,252 permanent seats and another 900 bleacher seats could be added. 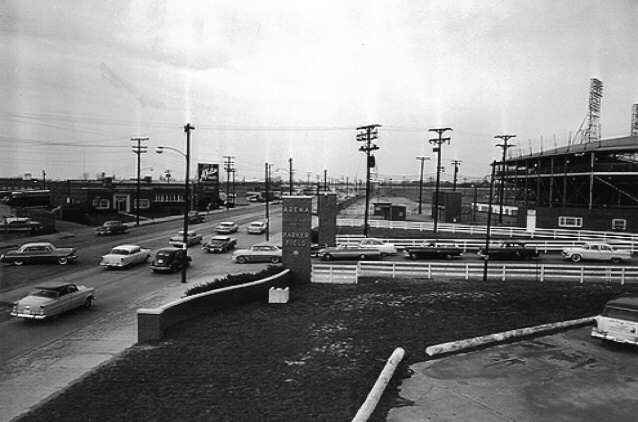 It was located adjacent to Parker Field, the ballpark home of the Richmond Virginians and Richmond Braves built in 1934 and later replaced by The Diamond in 1985. 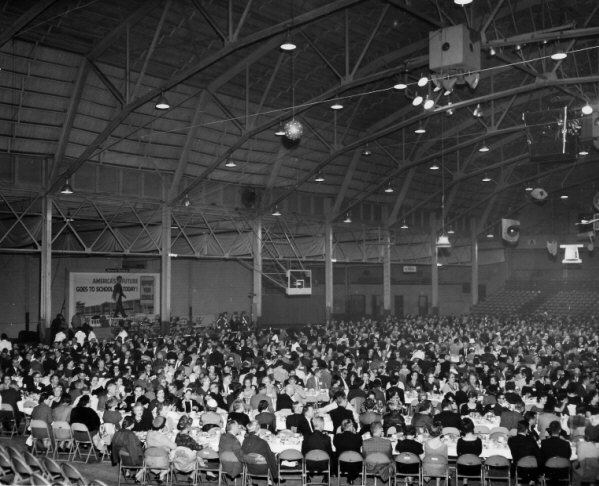 Many different types of events were held at the Arena. Rock concerts, basketball tournaments, car and boat shows, tennis matches, boxing, roller derby and all sorts of public events were held there. Presidents Reagan, Johnson, and Nixon spoke there. The Harlem Globetrotters set an attendance record there of 6,022 in 1955, all chronicled in Harris's reporting. But it was pro-wrestling that would become one of the most popular attractions at the Richmond Arena. 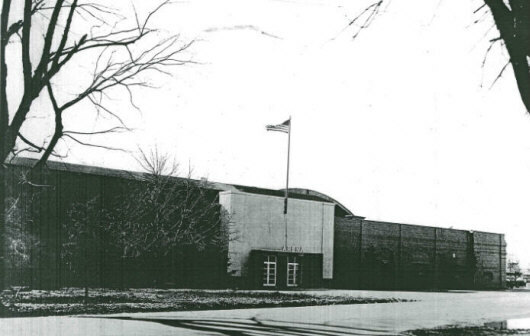 In the 1950s through early 1970s, Richmond wrestling primarily took place at the State Fairgrounds at Strawberry Hill, although there were occasional shows at the Arena. The last Crockett Promotions card held at the State Fairgrounds was on March 8, 1974, headlined by a Mid-Atlantic heavyweight title match between champion Johnny Valentine and former champ Jerry Brisco. The following week, the Crockett "B" shows moved to the Arena and split time for the next three years with the Richmond Coliseum, which had opened in 1971 and typically featured the larger shows. 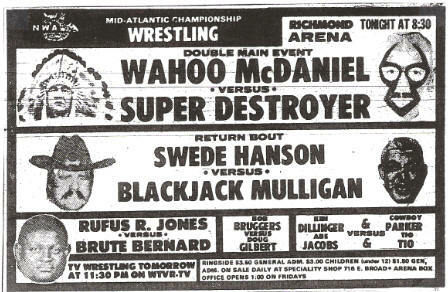 The first Mid-Atlantic Wrestling card at the Richmond Arena after the Strawberry Hill shows ended featured a lumberjack match main event between Swede Hanson and the Super Destroyer (Don Jardine.) For the next three years, most of the major names in the wrestling business appeared there, including NWA world title defenses by Jack Brisco, Terry Funk, Harley Race, and Dusty Rhodes. Like many of the old wrestling venues from days gone by, the Arena had its good points and bad points, although we typically look back nostalgically at these old wrestling venues with a romantic eye. The building was not insulated or air conditioned. "The Arena was hotter than the hinges of hell," Rich Landrum told me. Landrum, best known to wrestling fans as television host of "World Wide Wrestling" from 1978-1982, was ring announcer in Richmond for over a dozen years, including all the shows at the Richmond Arena. 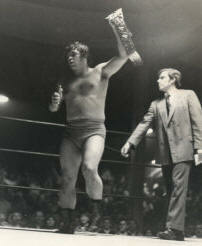 (That's Rich in the photo at left, along with Eastern champ Jerry Brisco in the Arena in 1973.) David Chappell remembers the obstructed views in certain spots due to the support beams that held up the upper seating deck. The cigarette smoke was thick and heavy and the crowds large, loud, and boisterous. "Perhaps as memorable as anything was the virtual maze of buckets placed to catch the rain leaking from ceiling leaks in its later years," said David Ross in his book Memory Lane: Richmond VA Vol. 2. The building had exposed rafters, which wrestlers would occasionally mention in event promos on TV, particularly Blackjack Mulligan who once threatened to throw a rope around the neck of Johnny Weaver and hang him from the rafters leading up to a U.S. title defense at the Arena. Landrum remembers the local cops working security detail at the shows at the Arena betting on the outcome of the wrestling matches. "It was penny-ante gambling, but they had fun gambling amongst themselves." Back in the day, apparently, even the cops didn't know the fix was in. Wrestling was a weekly attraction in Richmond, first at Strawberry Hill and then the Arena and the Coliseum. This basically ended in 1977 coinciding with the end of Crockett wrestling shows at the Arena. After a show there on June 24, 1977 (headlined by a tag team match between Johnny Weaver and Wahoo McDaniel vs. Ric Flair and Greg Valentine), wrestling became a bi-weekly event in Richmond, exclusively at the Richmond Coliseum. In the summer of 1981, wrestling briefly returned to the Arena for a series of five straight shows during June and July while renovations were taking place at the Coliseum. These shows featured a NWA title defense by Dusty Rhodes (against the Iron Sheik) as well as a special rare appearance by Pat O'Conner who served as a special referee for a U.S. title match between Wahoo McDaniel and Roddy Piper. The World Wrestling Federation held events there in 1984 when they were beginning their hostile expansion into other wrestling territories, and were probably the last wrestling events held there. 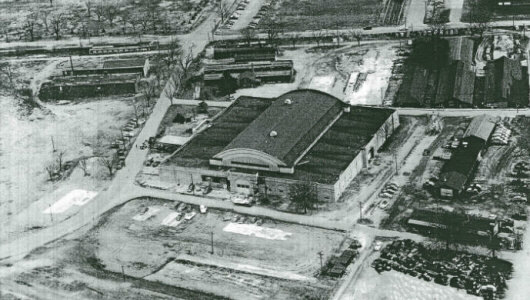 In the decades following the conversion of the old city garage into the Richmond Arena, other arenas in addition to the Coliseum would be built in the city including the Robins Center, Ashe Center, and Richmond Center. All of these venues competed for various events. 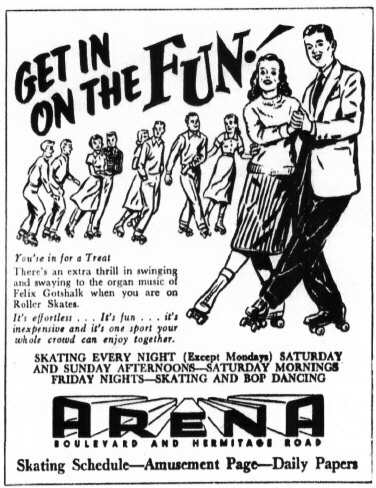 Mike Harris noted that the Richmond Arena, which was once hailed as the biggest and best arena for 400 miles, was now only the 5th largest in its own city. The building began to struggle financially. Like wrestling, which had moved out completely in 1977 to the larger coliseum, other events migrated to the other venues. The Arena was no longer a viable facility. The final public event was held there in 1986, a Hertz automobile sale. It closed its doors for good soon after, and was finally torn down in 1997, the land given to Virginia Commonwealth University. Richmond historian Robert W. Wiatt, Jr. lamented the loss of the building in the months before the demolition. "It is one of the best examples of early 20th century architecture in the U.S." he told Mike Harris. "We're tearing down all of our old buildings. My argument is we've saved some of our 18th and 19th century buildings, why not some of our 20th century buildings?" But time, which has taken many great venues from us in the name of progress and at the hand of obsolescence, claimed the Richmond Arena as well. Long time fans of wrestling in Richmond can close their eyes and still hear the sounds of the Arena - the thundering smack of Johnny Valentine's forearm, the blistering "tommy-hawk" chops of Wahoo McDaniel, or the cheers of the crowd rising in anticipation as Johnny Weaver shot his opponent into the ropes and prepared to lock in the sleeper hold. What they all would give for just one more chance to sit and sweat and see wrestling again at the Arena. The American flag flies proudly over the Richmond Arena. 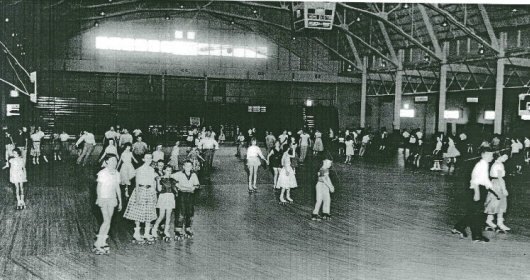 The interior of the Richmond Arena during a roller skating session is seen in this 1955 photograph. Historical information for this article was drawn from several articles which appeared in the Richmond-Times Dispatch, primarily an article by Times-Dispatch writer Mike Harris in the July 23, 1997 edition of the paper. These articles were provided to us by Thomas Derr. Main photo of Richmond Arena provided by Chris Bryant. 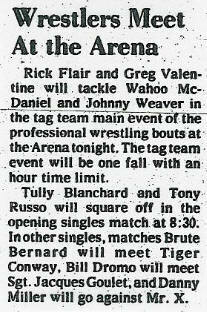 Image of the Richmond arena below is from a microfilm/photocopy of the 7/23/97 edition of the Richmond Times-Dispatch. Other photos provided by Thomas Derr. Photo of Jerry Brisco and Rich Landrum by Bill Janosik © Bill Janosik. Photos and images in the section on Arena General Manager C.W. Hudson (below) provide by Douglas Hudson. 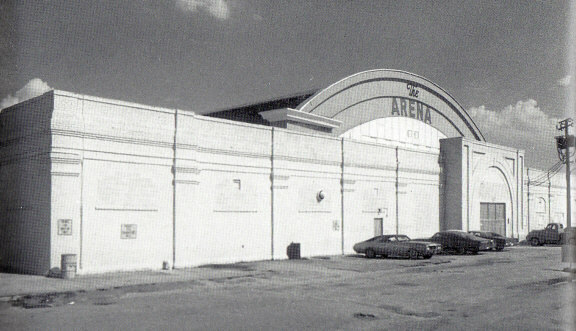 Information about wrestling at the Arena was gleaned from conversations with David Chappell, who regularly attended wrestling events at the Richmond Arena and elsewhere throughout the 1970s, and Rich Landrum, who was ring announcer for the shows in Richmond throughout the 1970s as well as host of the television program World Wide Wrestling from 1978-1982. David Chappell also provided additional match research for this article. Cy Hudson was the general manager of the Richmond Arena during its heyday. 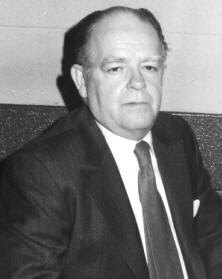 Hudson originally operated all of the concessions at the Arena as well as other sports venues around Richmond, and became the General Manager of the Arena in 1958. He promoted many events there, including dances and concerts, including once bringing Bill Haley and the Comets to the venerable old building. Of course, wrestling was a always a big event at the Richmond Arena, likely going back as far as the Bill Lewis era and was a mainstay there when promoted by Jim Crockett promotions. Hudson knew many of the wrestlers, and occasionally played golf with Wahoo McDaniel when he was in town for wrestling. Many thanks to Cy's son, Douglas, who provided us with several additional images from the Richmond Arena seen below, including the great shot of the entrance to the grounds where stood the Richmond Arena as well as the minor league baseball's Parker Field. Images in this section provided by Douglas Hudson. 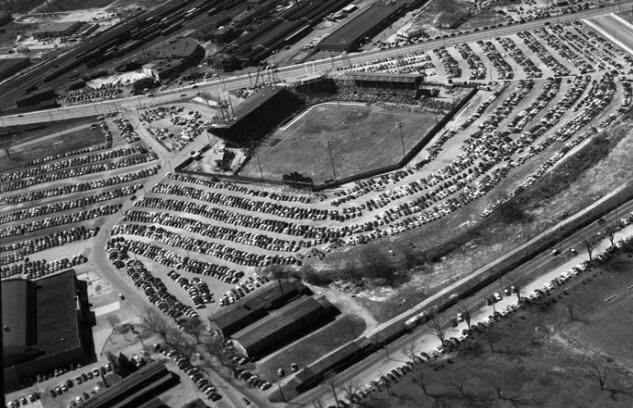 Richmond's Parker Field (circa early 1960s) with the Richmond Arena seen in the lower left of that photo. Newspaper images from the Richmond Times-Dispatch.